Tennessee had a Bow only Velvet Buck hunt this past weekend for the first time ever. TWRA reported there were 727 bucks taken from Friday until Saturday. I'm not sure how many were taken with a self bow but I know of one for sure. The good lord blessed me with one.I took this 8 point with my Osage bow I made at the Tennessee Classic this year, a cedar arrow and an Old Bear Razorhead! Lets see some of yours. Post some critters you have taken with your self bows! Nice Buck. Congratulations, you did it the hard way. Fantastic job! Selfys are a very fun way to deer hunt. Congrats on a great achievement. .I guess ewe go by the same handle so maybe some of that good stuff will come my way...I have been thinking hard on making a bow....A fat doe would be a trophy if it was with a bow that I made. That really is a great achievement all around. Are you having your deer mounted? A velvet mount would be Unique! Congratulations on a dandy buck! Working on a piece of "knotty" osage right now....so maybe some year there might be a picture?? I've had the pleasure but don't do much photography. Nice deer. What was the rationale for a "velvet" hunt? I am going to get it mounted, I am still pinching my self over it. I was and still am on cloud 9 over it and I love that Bow, I named it MOJO and boy does it have it. As far as to why they had this velvet hunt I am not sure. Kentucky does one each year and I know a bunch of Tennesseeans that go up there to hunt them. Maybe the TWRA saw this as a way to bring in out of state hunters or have heard complaints about if Kentucky does it why don't we do it? I believe it is a two year deal and they are going to evaluate it, I am sure they made some money on the deal. The only thing I see that bugs me is it is private land only. All the hunters that can only hunt public land were left out and I have heard some rumblings about that. It was on the warm side but not nearly as bad as it could of been. We had a slight cool spell for the weekend. Thanks guys for the good words. Was a $ deal. My sway will be to give archery hunters the 1st week of Nov and push season to right one week later. Cant see Smag giving up one of my hard horns on state tag. I know, i got a Campbell buck and doe three a day. . . . Plus Quota’s. So Goob, when big Mui steps out after you shoot that other 4x4 what then? You know we gonna here folks cryin “we need unlimited bucks” after this test hunt, when rut busts wide open. nice , congratulations..nice feeling taking a critter with a bow you made from one piece of wood !!! Congratulations. That's a beautiful deer. Being successful with a homemade selfbow is about as good as it gets in my book. Bassman show em the monster you shot last fall in PA with your self bow! Nice. I took one twenty-six years ago with an old lemonwood, and will try a few times this fall with my osage selfbow. Congratulations on a fine hunt and deer. Shawn, I would like to think I will get another chance at the other one. I just hope I get a chance at a big doe or two for the freezer.I am a Bow hunter and wouldn't bat an eye at shooting a fork horn if the shot presents its self. I liked it, this early hunt that is and I saw more deer move than any opening weekend I can remember. I have no regrets, anytime I get a chance to send an arrow at one I consider it a blessing. I am very very particular about the shot when it is time to take it. I am just as tickled with this fuzzy horned deer as any hard horned deer I have ever taken. I have already eat some back strap and he eats just as good too! Very nice CrowFoot. That truly is a beautiful buck. I know that pinching yourself feeling and it's awesome. I'm still pinching myself from my first bow kill. I shot this four point standing on the ground with a Hop Hornbeam Selfbow I made. The tree it came from was standing less than thirty feet from where I was standing when I shot him. PS now it's that Do it Again feeling. CrowFoot, Congratulations on a very fine dself-bow killed deer. Yes, I took a deer with a selfbow 2008. Awesome story Bow and deer Brogg! Very Cool man! Thanks CrowFoot and congrats again sir. Thats cool BJ. Shot a few right where i harvested wood from. Funny twist on hunting and hathering! The last one I got, I got almost within sight of where I cut the osage tree, less than 200 yards away. I didn't take any pictures though. Just took him home, cut em up, and ate him. Where’d ya get that Stave from Mojo? 2017 DEER. The bow for all three is osage from our property. I need to make another the linear cracks look to be running, but still shooting and if the shooter does his part works pretty well. That's a great selfbow buck Goob! You will have to tell me the story of how it went down at the Classic next year. I've only got 3 selfbow kills. 2 deer and a frog. The first one was an 8 point taken with a stone point and my osage hunting bow. My second was a small one taken with my osage hunting bow and a trade point that I made. This deer actually dropped in the road. No dragging needed. Congrats! That's hard to top! what region were you hunting? My best with any weapon and it was with an osage selfbow, off the ground in a brush blind in a patch of white oaks, I used a wood arrow and Zwickey Delta head. Clint was he rutting and did you grunt to stop that big bull? I remember that was my first year at Marshall PA meet. The mini bow challenge. Good for all above.Last year i shot 12 pt. 23 inch spread buck that scored a 158. My dream buck.I know how you guys feel. Good hunting and shooting. Clint you look like a Giant in that picture, nice one, that is a TOAD! Thanks Pappy, for the comment and all the help over at Twin Oaks. The stave for that bow was gifted to me by HedgeHunter I guess I should add. He said it was from the trail of Tears. Maybe that explains the MOJO? Dang Arvin, that is awesome man. All these pictures on here are! Yes, 150yr old tree fosho. Was right next to a low water crossing on trail in Todd, KY. Has the Mojo it beat my score at Classic and that was the highest 40 target SB score i ever put up mation wide! That critter from Namibia or San Angelo? Congratulations on the broadhead flight bow record to Arvin. Nice animal. Them Natives are exprorating land in S Afrika now. Place is fixing to turn into the CBT zone soon! Prior to El Salvador taking over asthe most dangerous place on the planet SAfrika had that title. Have a good bud from there i ran the high country and southern desert in AFG with. He use to tell me the terd stories of the new GVT and crime wave there. Namibia for me soon. Richard, who made your bow? I can tell the way it lies there its very well made. Bridger with my first. He's happy. Bowmania, I hope ya gave Bridger a bite or two. I was to tired to drag this one out so I let him go. Shot a dog fish with an Osage self bow, self made 4 point footed arrow and a flintridge stone point. A selfbow buck with osage bow and zwicky eskimos from this last weekend. Beautiful buck Keith. Well done. Nice buck Kieth. Gotta story for us. I love a good hunting story. Now this wets my appetite to finish redoing my out building so I can get back to scraping wood. Thanks folks and nice bows and game. Have been taking off from archery, because of dwindling health, but have stabilized and wanting to get back to it and thank you everyone for posting. Jeff I will finish those two bows. I went out to a buddies feral farm that is awesome for deer. He has let me hunt there for several years now, except last year when there was a 150 buck running around there. But that's ok, it's his place and I am fortunate that he lets me hunt there. Anyway, it was the second Saturday of the season, first time and evening I was able to get out. I know right where I wanted to put a stand with the wind, kicking some does as I went in. I had a bonus doe tag so I was feeling confident. I hung my stand, strapped myself in and hoisted up my pack/bow/ arrows. Hung my still unstrung bow on a limb, hung the pack on a limb and put arrow quiver, similar to an asbell quiver into a crook of the tree with intentions of hanging it up in just a minute. A small basket rack buck comes in, but I have no intentions of shooting him and he mills around under the tree at 12 yards for a while, while the other buck I shot shows up and works his way in. Remember my bow, it's still unstrung and hanging, because I just got into the stand. I stung up the bow seated while the bucks had their heads behind trees. I grabbed an arrow out of the quiver, but the quiver is just barely balanced in the crook of the tree, falls and hits the ground. It's windy so the small buck doesn't think anything of it. The small buck moves out of the immediate area, and the larger buck comes in at 12'ish yards. I did manage to stand up at this point. I don't have my finger glove, or my arm guard on because they are still in the pack because everything is happening so quick. I shoot, but I shot way to the right and high because I'm not used to no glove and the bow is a wrist slapper, so I may have caught the string. I spined him. The buck goes down, and just lays there like a dog, in no apparent distress, just looking around. I stand there for a few minutes waiting for his head to drop. Remember my arrows, they are on the forest floor. So no second arrow. I sit down, this is when he saw me. He moved his front legs and belly crawled about 10 feet and just lay there again. Again, no distress whats-so-ever. We both sat for another 5 minutes, and I thought, "man, I need to get another arrow into him, but I'm going to have to run after him through these thick woods, with him moving out on two front legs." So, I get out of the stand, grab an arrow out of my now broken quiver, and luckily he only belly crawled a few feet more and I put another arrow into him. So, that's my 1/2 hour on stand hunting story. From 2016. Public land doe, shot from a ground blind. The blind is basically a couple of long tunnels cut into thick brush. Osage bow with Wensel 3 blade broad head. My best buck with a self bow and stone tip that I knapped. TN 13 point. 2017 kill with a stone tip. The selfbow is backed with Mt. Lion rawhide. The bow was still ruffed, not sanded or finished. It’s the best shooting bow I’ve ever shot. 16 yard shot. I was a fun day. That elk looks a tad swelled. How ling it take to find that cow? Fat ol girl. Ive shot several lead cows. Fortunate she did not leave drainage. Morning shot, so a gud bet. Tuffhead cut off the aorta at the top of the heart. They basically roll down hill until they hit a big enough tree to stop them. Hard quartering away. Well tuned 680 grain arrow, razor sharp head. More to come Arvin i’m sure. The Hedgehunter took one with the 2017 HHB tonite. Felt good to see that Jim Davis footed arrow with 200grn point do its job with a less than perfect hit. Saw the wobble at 20yds out. Then, the tip over at 45yds. First decent hunt weather of the season here and they were moving well. Awesome Shawn! Is that the bow you made this year? No made in end of 2016. Shot a buck with it then. I reshaped the shelf a bit after Worlds. I shot it and my Elm there. Shoots better with 200grn BH's now. Deer are seeking right now. Gotta get after it before smokepole season turns the forest upside dowmn! How you fella's doing in CO? Got a small this morning. The HHB with Magnus and 75 weight is prolly on the best matchups I've ever used. Here's a button from Oct 21st 2018. Good angle to the heart. Looked like an aweful small spot to pick at 17 yds. Yet, there was no doubt when that arrow hit fur. Some to be said for a quiet bow. More pics for 2018 we lost. This was m last selfbow kill several years ago. Not much of a picture, he was walking down a logging road just a dusk. I decided not to stop him as he walked by my treestand at about 10 yards. I picked a spot and released, I had no idea where I hit because my wild turkey feathers disappeared in the fading light. The buck mule kicked and took off down the road, I gave him about 15 minutes before I got down and looked for sign. He had run down the logging road, all I found on my hands and knees were a couple of pin head sized drops of blood about 50 yards from where I shot him. I decided to take my stand and all my gear back to the truck then take up the search again. I was walking down the logging road toward the field where I parked my truck and saw a white belly in the old road. There is now feeling like going from this is going to be a tough recovery to there THERE HE IS. The shot was perfect, right behind the shoulder with the broadhead stopping on the off side shoulder. A bit of tissue had plugged the entrance hole so there was no blood. I was shooting an osage bow, chundo arrow with a magnus head. I snuck up to this Six point yesterday. Shoot him with my "Simply Orange " selfbow. He's my second selfbow buck and he was just as exciting as my first. Hell of a job. Was it still bedded when you shot it? Thanks Steve, he's a pretty nice little buck and should be a good eater. My favorite kind. Sorry CrowFoot. No it was a steel ace broad head I got from Matt at trade blanket a few years back. I was hesitant to take the somewhat questionable shot at him in the first place and decided if it was going to happen it was going to be with a steel point. Still looking for that stone point buck, but I'm really just very happy to have this guy. Are you going to be able to put that bow down and hunt with one of your other creations ? Successful stalk on a bedded buck and executing the shot with a selfbow of your making. You are definitely doing it right for the full experience. Congrats. CrowFoot thanks for the kind words. I've got a really sweet bend though the handle I've had shooting since last winter. I finished it with white tail Antler tips recently while waiting for my beans to dry. I've been seriously thinking about picking that one up. It's pretty and shoots great. I'm hoping to get a chance to carry it to the woods yet before the guns come out. That Button was a 17yd shot hard going away. Like that Hedge bow. What BH was that? If your asking me what Broadhead that was HH. It was a Ace 135grain I got from Matt at Marshall Primitive Archer Meet trade blanket. Really don't know anything more about it. I had six of them in a plastic baggy. And several bags of other broadheads in the trade. This HHB wont quit. Aim small, miss small. Well done HH. Here's mine from the other day. Great glad you posted here Steve. Got to get guys to post there old pictures. LW lost the earlier ones. Straight down HHB shot in this photo. Ft Campbell midget deer. This thread is good stuff. I love seeing all of the success! Seen these about 25 times many sites. 2018 selfbow harvests here started by D’Wayne. Wow, Shawn, you're having a hate Jimmy night it seems. I didn't interpret his post, "Post some critters you have taken with your self bows!" as 2018 exclusive. Not sure what I did to offend you. Please fill me in. Not all. Celebrating Tenn landslide wins statewide. Tonite is like the superbowl, WS and world cup but better cuz in morning it means somethin to the folks. Those other things dont. Let me begin by saying that I think DeWayne meant to literally share your self bow kills. If you've seen some of these, I apologize up front. I had dinner with DeWayne two nights ago and he didn't seem upset, so I'll post again for those new to the site. This is an Osage kill. I shot this deer with the bow before I did the finish work. I had just roughed it out and tillered it. Here is a squirrel with an Ed Scott Owl Bow. A squirrel with the first bamboo backed hickory bow I ever made. First deer of the season with the Hackberry Hammer. I'd go on to kill 6 deer with that bow that season. Me, Pappy, and Grant Morgan also won the Whitetail Classic that year. A humiliating confession about selfbows. The first 3D tournament I ever attended was the North Carolina traditional competition. I read the signs as I went in. One said primitive shooters, and there was an arrow. I had a Martin Savannah hybrid longbow. At the desk I asked, I'd like to shoot the primitive match. I have a longbow and wooden arrows I made myself. He took my money and pointed me the way to go. Looking back, I can see that he likely thought I was shooting a bow I made myself, which is a thing I have no idea how to do. Anyway, I was alone, had no one to witness my score card, so I scored it myself, completely honestly. Turned it in. Went home to VA. After about a month, UPS delivers a plaque, with a mounted wooden arrow and a gold plate that said, First Place, North Carolina State Championship. I was elated and hung on the wall I my den. The next spring, at another NC 3D, some strangers invited me to shoot with them. I still had the Martin and during that shoot I mentioned having one first place in the primitive class. Of course they straightened me out. No factory bows. No fiberglass. Boy did I feel low. Not only did I deserve the win, but someone else did. I still have the trophy, but not on the wall, but a boxed reminder to make sure I are on the same page with the good people in the same competition. Kinda like posting decades old pics in 2018 thread. All gud, they great pics. Thanks for sharing the pictures Jimmy. I'm new here and haven't seen them before and really enjoyed them. I didn't notice anywhere that it was a 2018 selfbow kill post. I guess I shared pictures of both my selfbow kills. One from my first year hunting with a bow in 2016 and my second I just got a few weeks ago. I believe I saw others that posted pictures of earlier kills also. I guess to me selfbow hunt pictures never get old. I always enjoy seeing them. My first selfbow kill and one that would convince me that a simple piece of wood was more than adequate to kill a deer. 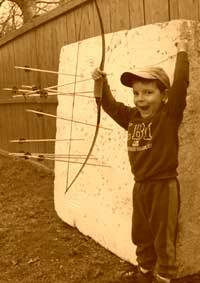 My first bow was a boat paddle hickory bow, 70# but so poorly tillered that it probably shot like a 40# bow. The poor tillering also gave it hand shock so severe it would jar your toenails loose. Anyway, a doe walked right under me, I let her have it quartering away but didn't get complet penetration. Her buddies ran to a honeysuckle thicket about 50 yards away and started feeding, she joined them not knowing what happened. I must have gotten one lung because she stood in the thicket for about 10 minutes before she sagged and hit the ground. There was about 100 acres of grown up pasture behind the thicket, with no exit wound I never would have found her had she not stood in one place. Don't know why that picture came through as a thumbnail, one more try. We can start a fresh BJ. They been on PA for years. Always gud to see SB harvest’s i rekon. Not done yet this season yet. Gets tougher with SB after ML and rifles season for sure! Taking a mature buck with SB in rufle season is Tough Work. I’ve taken a few but not many. This one got deleted earlier. It’s from a few years back. Sinew backed hickory board bow. I reverse tillered it until I got it to about 7-9 inches of reflex, Then applied the sinew; kinda preloaded like perry reflex. Heres a few years back. 43lb Waiwi selfbow built in 2000 in Ranger Camp on Oahu’s East Range killed. He had been wounded by a ML. Deer had 11” base and a 9” dressed was 224lbs. Taken at my place in 2010. Have never seen one even close to his body sized in 18yrs hunting Tenn. Funny i have shot three bucks now since 2009 that were wounded by Muzzle Loaders. Yup , like I was saying. Never pictures like those never get old. I'd look at em in black and white. BJ Gonna start the 2018 SB Kills thread soon. It's been a minute since I could get back on here. Nice pictures folks, truly awesome. Jimmy Blackmon you should have a TV show. Impressive , I really like the taking the bow out and killing one with out even finishing it. I bet Pappy about stroked out! Hunting out the full deer season with a HH Ironwood. Took her into a big Cedar thicket on monday. Ran into a nice bloodtrail from day before. Followed to a bloody bed, no deer. Guess that bow hunter did not get his deer? Did find a dadny drop while on that spore! Time for coyote with selfbow out of hasty ground blinds. Finding some really good sheds BTW too. great thread...It was a great year for me. I finished a sinew backed black locust on a Friday and took it on it's first hunt the next day. I was just about too give it up for the day when I saw this buck coming from down hill. He just walked straight up and into a perfect shot. It was awesome. The arrow went completely through him and later I found that it went through his heart. He went maybe 50 yards before he was down. I also put a spike and an old doe in the freezer with it before the season ended. Nice body on that deer. Bow has a nice cast. An Ed Scott Owl bow is on my dream list. I should have bought one 6 years ago..
Congrats BowAholic on a beautiful buck. Nice bow, too. Never seen one. What's the deal with them Bill?